Walkers, joggers, picnickers and passers-by at Cubbon Park stopped for a moment or more near the gazebo close to the Cubbon Park Metro Station. 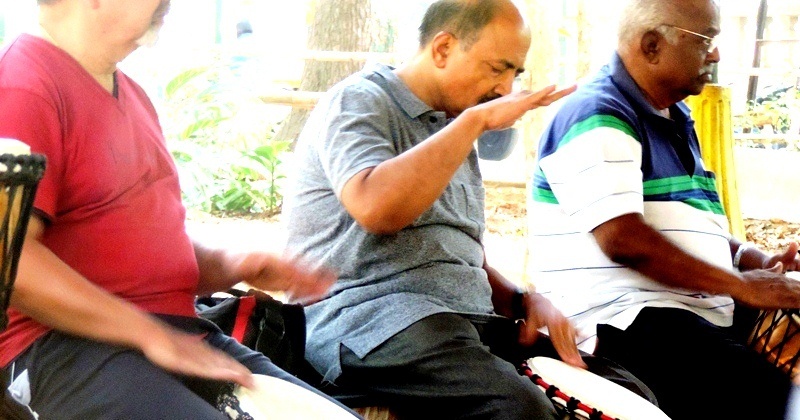 They heard the sound of drumming, of voices – and their astonished gaze fell upon twenty senior citizens (age 55 and above), energetically starting their weekend with a Saturday-morning drum jam! Silvertalkies Drum Jam was led by the ever-buoyant Mr. Ashirwad Achrekar, the seniors first understood the brief history of the djembe. It was brought in the 1960s from West Africa to San Francisco and first taught one-on-one, till the idea occurred to Mr. Arthur Hall, the pioneer of drum-jamming, that this instrument would be ideal for sessions in which people with no prior knowledge of the instrument came together to play. The idea, Mr. Ashirwad clarified, was to harness the bit of music all of us have within ourselves, and put all energies into the instrument – to go with the flow, moment by moment. The first step in playing the instrument is to hold it correctly. Mr. Ashirwad demonstrated, then went around the circle of seniors, correcting their grip. There were some warm-ups. Each senior spoke her or his name to a beat, played on the djembe. Everyone followed the rhythm and spoke the name. Within one round, everyone was familiar with each one’s name. The djembe is a unique instrument in that both treble and base are found on the same surface. The middle gives base, the sides give treble. Seniors practiced with base-treble, base-treble, touching the djembe with all the fingers for full effect. The base impacts the body from the navel down, to improve blood circulation. Mr. Ashirwad led the group with ‘dhoom-dhak’ sounds, to keep the beat. “Use both hands! Enjoy the sound!” he urged. Sometimes, he hummed as the seniors kept the rhythm. Once, he sang the opening lines of ‘Ae Maalik Tere Bande Hum’. He taught the seniors to change tune with directions like ‘left-right, left-left-right, left-right-right’ and so on. At one point, he requested two participants sitting facing each other at opposite ends of the gazebo, to keep a beat. Others then joined in, one by one, adding their own rhythm to the beat. It took a bit of hesitation, a bit of faltering and halting, but finally, the whole group was playing like an enthusiastic percussion orchestra! To vary the sound a bit, Mr. Ashirwad added bells and traditional ‘dandiyas’ to the mix. The final emotion to be expressed was that of being ‘lost’. An intriguing beat emerged, and, as everyone was in the thick of playing it, Mr. Ashirwad suddenly shouted, ‘Now let’s find ourselves!’ and the participants changed the beat as one. Finally, there was a great burst of energy with half the participants moving to the center of the gazebo to dance, while others kept time and sang. All inhibitions forgotten, these seniors truly enjoyed themselves! There are several health benefits to playing the djembe, the most obvious one being increased blood circulation. One gentleman with a slight tremor in his right hand remarked that it had reduced for a few hours after a session with this drum. At Silvertalkies, the seniors learnt something, had a morning full of companionable clattering and a great deal of fun while reaping these benefits! Sonali Bhatia is a Bengaluru based writer and storyteller.